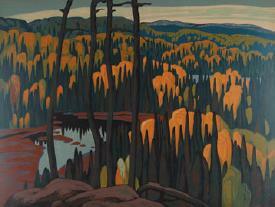 Lawren Harris, Algoma Lake, silkscreen, c. 1945, 30″ X 40″. Unseen Silkscreens is a unique historical collection of prints initiated by the Sampson-Matthews graphic arts company in the midst of war. An important contribution to the Canadian art scene from 1941 to 1963, the prints have been gathering dust in attics and institution storage rooms for many decades since. But with this upcoming exhibit, a West Coast curator hopes to bring them back into the light. “These prints were a complete cross-section of our most prestigious artists,” says Ian Sigvaldason, owner and curator of Pegasus art gallery on Salt Spring Island. “At the time, the art was considered modern, even avant-garde.” He says collectors are just starting to realize the works’ significance. As the value of the original paintings rise, so does the value of the prints, he says. Sigvaldason’s show will consist of about 50 silkscreen prints, several by Group of Seven artists as well as West Coast painters including Emily Carr and B.C. Binning. A total of 89 silkscreen prints were produced over a 22-year period under the direction of Ernest Sampson, a pioneer of silkscreen printing in Canada, and his partner Charles Matthews. Artists hired by Sampson-Matthews, like Franklin Carmichael and A.J. Casson, made a ‘translation’ of the original onto silkscreen. It was an exacting process, and eventually became obsolete as inexpensive photographic reproduction emerged, Sigvaldason says. By 1963 the unique print-making project had run its course. The struggles of the Depression era inspired the make work initiative, and it was supported by the federal government and the National Gallery of Canada. “Artists had a hard time making money, and people didn’t have the money to buy art,” Sigvaldason explains. Compelled to focus on their day jobs, he says many artists worked as etchers, engravers and printmakers. Emily Carr ran a boarding house and E.J. Hughes became a postal worker. Some prints, such as Isabelle McLaughlin’s Blossom Time didn’t sell well at the time, so print runs were limited, Sigvaldason says. Others, such as A.Y. Jackson’s landscapes were in high demand, leading to several print runs and financially well-compensated artists. But even if the rewards were modest, artists were eager to have their work reproduced, and hundreds applied.